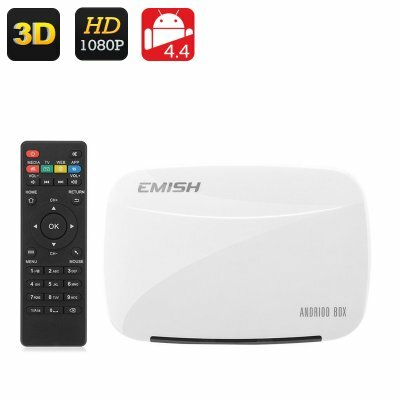 Successfully Added EMISH X700 Android TV Box - 1080P, Rock Chip 3128 Quad Core CPU, 3D Support, Kodi, Wi-Fi, DLNA, Android 4.4 to your Shopping Cart. Watch movies in HD, stream your favourite channels, play the latest games and more with the EMISH X700 Android TV Box. With the EMISH X700 Android TV Box, you easily can turn your living room into a movie theatre with the latest movies and shows waiting for you in the comfort of your own home. The TV box even supports 3D movie playback. The EMISH X700will let you stream all the content you want in 1080p and get the best watching experience for everything from the latest blockbuster to a simple cartoon. With Android 4.4 interface, you will not only enjoy great user experience, but will also be able to get the latest apps and tools from the Play Store and benefit from even more functionality. A nice feature of this Android TV box is the support of Google TV Remote, which lets you use your phone or tablet as a remote control for your TV. Simply download Google TV Remote app from the Play Store, and you’re good to go! With the EMISH X700 Android TV Box, you are instantly ready to get started. It comes with Kodi media player (also known as XBMC) pre-installed, so you can immediately start using the award-winning software to play your videos. With both LAN and Wi-Fi support, you can get quick Web access and a stable connection to enjoy your favourite streaming channels. The Android 4.4 TV Box comes with lots of ports (HDMI, 2xUSB, AV, RJ45, DC Jack and IR receiver), so that you can easily hook it up to external equipment. The EMISH X700 Android TV Box comes with 12 months warranty. Brought to you by the leader in electronic devices as well as wholesale Android TV boxes, Chinavasion.